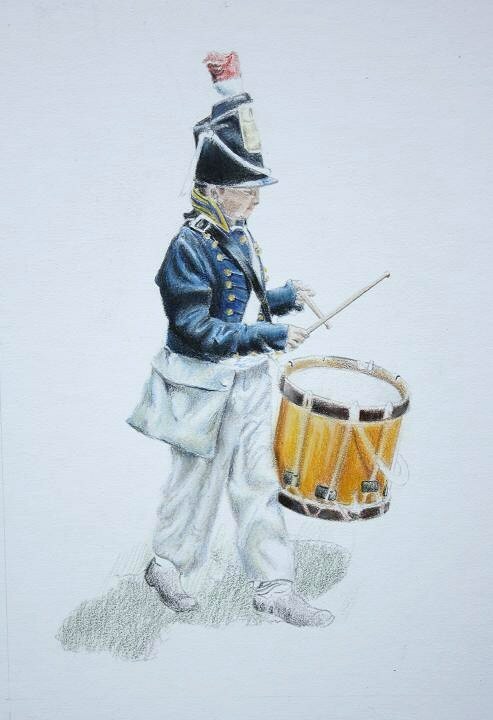 After several months of artistic inactivity, I am finally working on a colored pencil study of a drummer boy of the US 25th Regiment of Infantry during the War of 1812. This piece is helping me to get back in the swing of things. Using colored pencils has the advantages of not requiring a lot of space, they are portable, and can be cleaned up and put away in quick fashion. This colored pencil painting is relatively small measuring roughly eight inches in height on cold press illustration board. At this stage it is about fifty percent complete. Color has been added on top of color in attempts of achieving the desired hue and values. Once that level is reached, the colors are burnished which smooths out the tones and drives pigment into the tooth of the illustration board. At this point more color may be added, but the artist has to be careful not to apply too much color. I hope to use the medium of colored pencil to compliment my painting in oils and acrylics. I plan on starting a number of pieces in the coming months that depict soldiers of the 25th Regiment of Infantry. I have read and learned a great deal of these men over the past several months and I want to depict some of the events they participated in. I will also be looking forward to doing more aviation art in between projects. A work in progress (WIP) 'Drummer Boy' at about 50% complete. Much more fine tuning to take place. Accepting requests for commissioned artwork beginning September, 2011. Contact me via email at andyltuck@aol.com.